A small house in the Bulgarian village of Kirilovo, it has 3 rooms and a corridor and there is a summer kitchen, the garden is 1,700 sq metres. Kirilovo is close to the town of Elhovo. Bulgarian villages and towns are abundant, all with interesting properties to choose from. Investing in Bulgarian property is a great way to have a holiday home, a second income from rental or just as a nest egg. 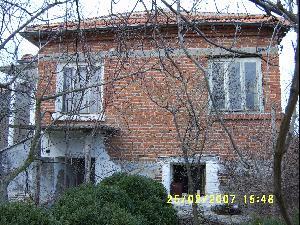 There affordable properties in Bulgaria to suit almost everybody. You may have heard of a particular village or town in Bulgaria, if so the search facility on the home page is easy to use. Contact us if you have any questions, we are here to help you. Further information about the Bulgarian notary act, legal issues, where to invest in Bulgaria, Bulgarian geography, Bulgarian culture, a smallholding in Bulgaria, how to choose the right Bulgarian property, news in Bulgaria, indeed, anything that you need can be found in article section on the home page. If not , contact us, and we will find the answer for you. Enjoy your research for Bulgarian properties.